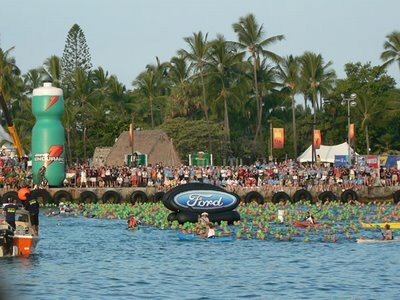 With less than 30 days until I head back to Kona for the Ironman World Championships, it’s safe to say that I have this great event on my mind. So I thought I would put up my race report from my first trip there in 1997 when I was a pro. Now, “race reports” didn’t really exist back then, but I kept a pretty detailed training log so I’m just going to convert my shorthand of details into a readable form. Race reports can be hit or miss, so proceed at your own risk…. I should probably back up a few weeks and provide a little lead up to race day first. This was a year that I was able to hit a lot of big races and truly get to race like a pro. Big races, big destinations and huge training days. Great fun. About 5 weeks before Ironman, I had a race in Nansei, Japan. Went out there with a few other Americans (Garrett McCarthy and Becky (Gibbs) Lavelle to name a couple), along with some others from around the world. They put us up in pairs and my roomate was New Zealander Cameron Brown. Lots of great stories came from that week, but that’s another day. I had a rough day on a rough course and finished 7th overall. I was in the middle of my Ironman build and was trying to get my iron levels back to normal after a summer at altitude, so I wasn’t happy, but satisfied considering. Got up at 4:40am. Had 2 Ensure type drinks, a banana and a powerbar for breakfast. Emmanuel Millet, of one of my sponsors, Aquaman Wetsuits, picked me up and took me to the start. Waited my turn to get marked and pump up the tires, then waited again to hit the port-a-potty. Ran out of time to get a run warmup, so I ran in place for a few minutes to get the blood pumping. Then it was time. So I got in and warmed up in the water. Ran through transition and passed 2 in the tent. Only Wolfgang was in front of my now. Rolled up Palani Hill, the enormous crowds and out on the Queen K (Slightly different course back then). Settled into my pace in 2nd place on the road. Sitting out there I had the company of 2 helicopters, and various press vehicles zooming by. Around 50 minutes into the ride, the first pack of contenders rolled by that contained Tim and Tony Deboom. Shortly after came all the big names. Jurgen Zack, Lothar Leder, (eventual winner) Thomas Hellriegel, Peter Reid, Christian Bustos, Cameron Widoff, Ken Glah and a couple of others. (note: looking back, this was one of those moments in your life that you look back on and smile.) I rode with the clan for a while and remembering thinking how the pace was not that bad. Out of my range for 112 at the time, but definitely attainable. Then the day started to turn it’s twisted turn for me. I began getting cramps in my left hamstring. Not that intense, but something that I needed to pay attention to. So I eased off a bit and kept stretching it out. Playing this stretch then pedal game spit me off the back of the group and there was now only 1 other rider with me. Lothar Leder. We rode in proximity of each other up the climb and headwind out to Hawi. At the turn in Hawi I somehow missed my special needs bag, which meant I had to improvise the rest of the ride and live off the aid stations. It pissed me off at the time, but it was a great lesson to learn. We had a nice tailwind coming down from Hawi, but when we got back to the Queen K, it became a stiff headwind of 30 mph all the way home. This is where my next problems showed up. The bottom of my right foot began cramping pretty intensely and there was noway for me to stretch it (no, getting off my bike and taking off my shoe was not an option). Additionally, the course drink by MetRx was not sitting well with me. Felt completely bloated, so I switched to Coke. As the ride wore on, the foot was getting worse. The cramp had now spread and climbed midway up my calf. The pain was getting beyond intense and the horrible wind didn’t help. I clocked 12mph on a downhill in one of the nastier stretches. Just outside Kona I was about at my breaking point and actually began to cry briefly. Thankfully I arrived in town shortly after and was protected from the wind. T2 was about 8 miles south of the swim back then, so I still had a ways to go, but was happy to see faces. A good friend and fellow pro at the time, Tim Watson rolled up next to me about this point. We exchanged a few words and rode to T2 together. I got off my bike and had trouble putting weight on my foot. One of the volunteers rubbed my foot while I changed and headed out with Tim (No idea of transition times as back then they were both added to your bike time). Steep climb out of T2 and then in and out of the “pit”. As I ran I felt better but never great. Pace dropped into the 7:20’s and then slowly crept upwards. 1:41 at the half, and began catching some of those who dropped me on the bike. Shortly after 13, I started running into problems again and the pace jumped about 1 min per mile. Held onto this pace until around mile 20 when the bottom just fell out. Pace jumped to well over 12 minute miles. Started stopping at every aid station and legs began stiffening. Started asking for potato chips at aid stations and people were digging through their personal belongings to get me some. Then I began peeing every other mile or so. Final miles were in a blurr. Very little memory of the run back into town to the finish. I crossed the line and walked over to my parents. We went over to the food and I began to try to eat. While talking to them I began to lose my vision. Everything was going blurry and I went from feeling bad to feeling like death. Some doctors came over and carried me into the med tent. Began to feel very cold and temperature began to drop. I overheard the doctors say that I was going into shock and then heard one yell at me to stop letting my eyes roll back in my head. Then every movement caused cramping. Even my jaw cramped. 3 I.V.’s and a shot of magnesium (for the cramping) and I came out of it. Bottom line: my sodium levels dropped too low and hyponatremia kicked in. I crept to the car and headed to the hotel, with my tail firmly between my legs. It was one of the worst experiences and best experiences I’ve ever been through. I decided that night that I would never attempt another Ironman again. It just wasn’t my bag. Olympic and 1/2 Ironman were more my thing. Then I got on the plane to head home and noticed that if I had just changed my nutrition like this and adjusted my training like that, then maybe I could…..
And that my friends, is how addictions begin.